Crooked or crowded teeth are very common in the growing patient. Even patients that get braces may develop a minor degree of crooked (crowded) teeth, particularly in the front teeth of the jaws, as they grow old. The first step in determining the need for treatment is what we call an orthodontic consult. During this appointment we may obtain special records and special x-rays of your child's jaw. This information will allow us to make a decision based on predicted growth patterns that your child may show later. In orthodontic terms we refer to this as Early Treatment. Early treatment refers to ANY orthodontic (braces) or orthopedic appliances (like Headgear) treatment that begins when the child is in primary dentition, or in early mixed dentition (when the first permanent teeth begin to erupt). Early treatment has been proven to be effective despite objections by some people in the orthodontic community. 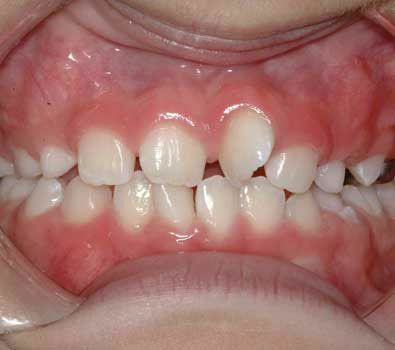 The AAPD recognizes that early diagnosis and successful treatment of developing malocclusions can have both short-term and long-term benefits, while achieving the goal of occlusal harmony, function, and facial esthetics.